Requiring law enforcement officers to wear body cameras as introduced by Senator David Haley. While many of the bills mentioned above have finally passed after years of perseverance, there are just as many introduced that have never received committee hearings and are often ignored. Bi-partisan cooperation brought great success in the 2017 Legislative Session. With that same cooperation, we have the opportunity to make our government work better for the people of Kansas. Kansas Senate Democrats are ready. “Today’s decision once again validates what I have been saying throughout the school finance litigation. Kansas children are being left behind because Governor Brownback and Republican legislators have failed to pass an adequate and equitable school finance law. “The Kansas Supreme Court has set an April 30 deadline, which three Supreme Court justices disagree with due to the last minute action on school finance by the 2017 Legislature. We cannot wait until the 2018 session to remedy these constitutional violations. Sam Brownback is leaving Kansas. Next Wednesday will be his Senate confirmation hearing and in the very near future he will no longer be governor. When he first became governor, Sam told Republican legislative leaders that he wanted to go down in history as the best Governor our state has ever seen. Shutting down the Joan Finney office building in Wichita and moving state agencies to less secure office space, which resulted in the recent shooting of a Revenue employee. With accomplishments like these, Sam Brownback will go down in history as the worst Governor our state has ever seen. “Sam Brownback will be remembered for becoming the most unpopular governor in America. His tax experiment failed to grow the economy as he promised. Instead, his policies have bankrupted our state and led to destroying nearly every agency of state government as well as his own political career. Last year at Demofest, I told you that the people of Kansas need and deserve a new and different Legislature. I told you that the only way we can stop Sam Brownback’s reckless tax experiment, his anti-public education and anti-labor agenda, was to defeat those Republican legislators who have rubber-stamped that agenda. Voters ousted more than a dozen Brownback rubber stampers in the 2016 primary elections and elected more moderates and Democrats in the general elections. The 2017 session of the Kansas Legislature did exactly that. We took the first bi-partisan steps to restoring our state from the reckless Brownback agenda. We put an end to the failed Brownback tax experiment, allowing Kansas to begin down a path to a solid financial future for the first time since 2012. We restored fairness to the tax code and eliminated Brownback’s “glide path to zero” income tax. We restored three income tax brackets that are still at lower rates than the tax brackets prior to 2012. We restored the Child Care Tax Credit to help Kansas families with small children. We restored the mortgage interest, property tax, and medical expense temized deductions, which will help homeowners and those living on fixed incomes. We put us back on a path to stabilize the budget, restore funding cuts made to K-12 schools, Regents institutions, the state highway fund, KPERS, and other important services that have had to bear the brunt of Sam Brownback’s disastrous policies. Less than 24 hours after overriding Brownback’s veto on our new tax plan, Moody’s Investor Services adjusted our credit rating from negative to stable. This credit rating change is further proof that the 2017 Kansas Legislature took the right step in overriding Brownback’ veto. I want to commend our ranking Democrats on the House and Senate tax committees for their leadership on the tax bill – Tom Sawyer and Tom Holland. After the veto override, we passed a budget that provided state employees a pay raise – the first time many had received a raise in nearly a decade. Our budget began restoring cuts to Home and Community based services by approving a 7% rate increase over the next two years, and we provided funding for additional beds at Osawatomie State Hospital. We also passed a bill to expand Medicaid. And, while Brownback vetoed the bill, we will not be deterred. We will expand Medicaid this next session. And, we passed a law to keep guns out of hospitals, mental health facilities, and adult care homes. While all of this was a major step in the right direction, it is just the first step. There is still more work to be done. K-12 schools continue to face inadequate funding, rural hospitals risk closure without Medicaid expansion, and our sales tax on food remains the highest in the nation. State agencies, including the Kansas Highway Patrol, the KBI, the Department of Corrections, and our state hospitals are understaffed and their employees are overworked and underpaid. We also need to extend the prohibition of guns to our college campuses. The damage caused by Brownback and his allies did not happen overnight. It will take time to fully recover, and it will take a continued bi-partisan coalition to undo the damage. But, while a bi-partisan coalition is important, electing more Democrats to the Kansas House in 2018 is even more important. You can’t always depend on moderate Republicans to do the right thing. But, the people of Kansas can always count on House and Senate Democrats to continue the fight to reverse the Brownback agenda. They can always count on us to be a strong voice for common sense policies that strengthen our state by investing in our people. They can always count on us to stand up for equality and social justice; to stand up for fundamental human rights, like the right to marry who you love or to make your own health care decisions. They can always count on us to protect the dignity of a hard day’s work for a livable wage, and to provide government services that help those most in need. Yes, and above nearly all else, the people of Kansas can count on the House and Senate Democrats to maintain a fair, sustainable tax system and invest those tax dollars to improve the quality of public education and our state’s infrastructure. We must work hard to protect the seats we won in 2016, and fight together in 2018 to win more in the Kansas House of Representatives. And, we must roll up our sleeves, put our differences aside, and work together to elect Democrats to statewide offices and to send Democrats to Washington D.C.
Because the last thing this country needs is for Sam Brownback’s failed tax experiment to go national. In the 41 years I’ve held elective office, I have staked my reputation and my public service on working for and with the Kansas Democratic Party. Through the years, we have celebrated election night victories and endured painful election night defeats. One such election night defeat I shall always remember was in 1986. That was the night Tom Docking lost his race for Governor. And, even though he was not able to follow in the footsteps of his grandfather or his father, Tom Docking never lost his purpose and passion for life. He never lost his involvement in the Kansas Democratic Party nor his commitment to the Wichita community and to our state. So, as we enter yet another election cycle in 2018, let us follow the example set by that great Democrat, Tom Docking. Let us never lose our purpose and passion as Democrats. And, let us never lose our commitment to the Kansas Democratic Party and, more importantly, our commitment to the people of Kansas. “First and foremost, in 2004, I supported state legislation allowing DACA students in Kansas to pay in-state tuition at our Regents’ institutions and community colleges, if they meet the qualifications. This law is our state’s version of the Dreamer’s Act. “It should come as no surprise the main opponent to this law was Kris Kobach. He predicted that thousands of DACA students would take advantage of in-state tuition. Last year, 668 students used the program. “These children, who have only known this country as their home and have bright futures here, should not be put at a disadvantage for the actions of their parents. Want Capitol Comments sent directly to your inbox? Click here to sign up. Session adjourned Sine Die on Monday, June 26. The 2017 Legislative Session has officiall y come to an end, for now. This year’s session reached 114 days, including Sine Die, which ties the record for the longest session in Kansas history set by the 2015 Legislature. On the 110th day of session, I had the privilege of leading the Senate in prayer (pictured on the right). In the extended time that we were in Topeka, the focus remained on a tax plan, a school funding plan, and a budget. The Legislature also covered a number of issues that were considered unfinished business for the session including: prohibiting guns in mental hospitals and other community healthcare facilities, adjusting KPERS working after retirement rules, delaying amusement park regulations, creating a child welfare task force, and expanding consumption areas in cities and counties. Our work to restore fiscal stability to Kansas has only just begun. 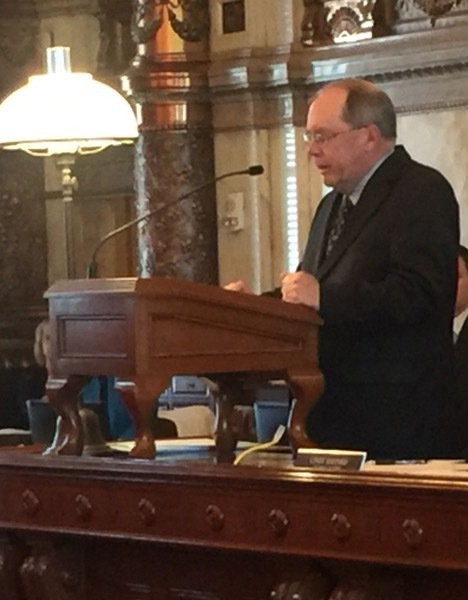 The Kansas Supreme Court will hear oral arguments on the new school funding plan in July. Schools will remain open while they consider the new law, but I anticipate the Legislature will be reconvening for a special session to address the unconstitutional components of the new law. Now that summer is officially here, I am looking forward to spending some quality time out in our community. Should you have any questions, feel free to contact me at 785-296-3245 or by email at Anthony.Hensley@senate.ks.gov. I also encourage you to follow me on Facebook.com/SenatorAnthonyHensley. Thank you, again, for your continued support. As a result of a collaborative effort between both parties, Kansas taxpayers will see a change in their taxes beginning July 1. Although the changes go into effect on July 1, Kansans likely will not notice a difference in their paychecks until mid-August, depending on how their pay periods fall. These changes were a necessary first step in making Kansas fiscally stable. To be clear, taxpayers will still be paying less than they paid in 2012. In fact, if this plan had passed instead of the governor’s reckless experiment, it would have been called a tax cut. In 2012, a married couple filing jointly making $60,000 or more in adjusted gross income paid a tax rate of 6.45 percent. 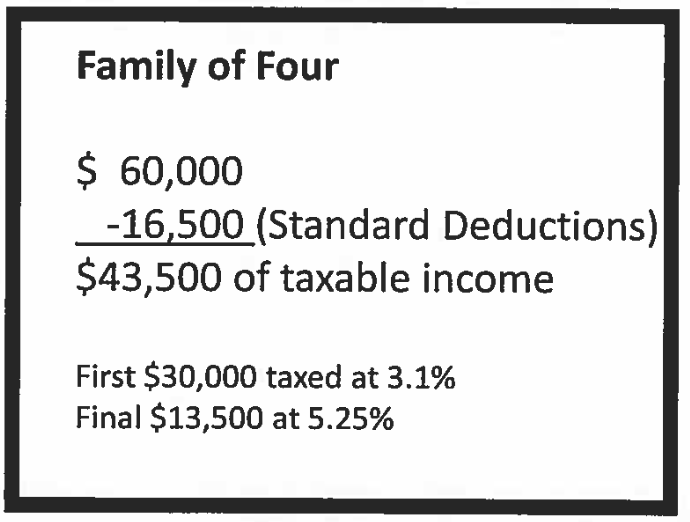 Under the new tax plan, that same couple will pay a rate of 5.7 percent. In 2012, a married couple filing jointly making between $30,000 and $60,000 in adjusted gross income paid a tax rate of 6.25 percent. Under the new tax plan, the same couple will pay a rate of 5.25 percent. In 2012, a married co uple filing jointly making $30,000 or less in adjusted gross income paid a tax rate of 3.5 percent. Under the new tax plan, that same couple will pay a rate of 3.1%. Additionally, under this new tax plan, the child care tax credit has been restored for families with children. The itemized deductions for mortgage interest, property tax, and medical expenses have been restored at 75 percent in 2019 and 100 percent in 2020. 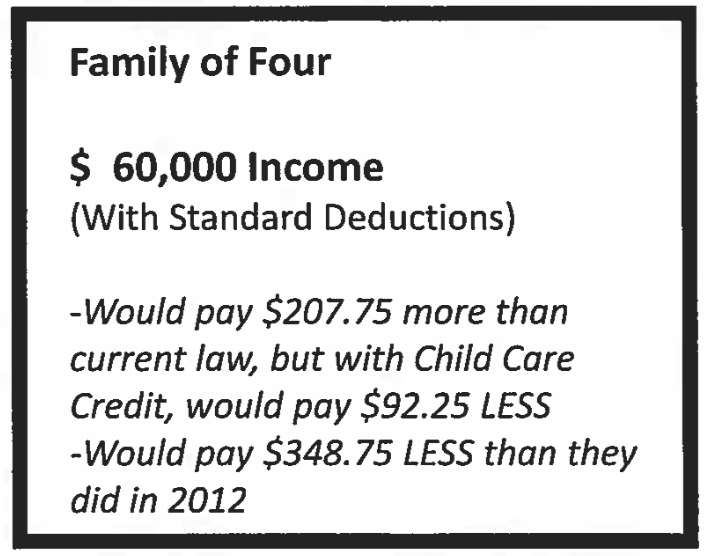 The removal of these deductions and credits in 2013 to help pay for the disastrous Brownback tax experiment targeted primarily Kansans living on fixed income and Kansas families with small children. Further, the restoration of the child care tax credit will cause some families to pay less now than they did last year in state income taxes. The actions of the 2017 legislature are a crucial beginning to the recovery from the self-inflicted budget crisis caused by Sam Brownback and his political allies, but there is still more work to be done. Our sales tax rate on food remains of the highest. Our state debt has expanded causing us to pay more in interest on that debt. Our state highway plan – which would have created 175,000 jobs by 2020 – has been nearly eliminated by continued sweeps. Our schools continue to be funded at unconstitutional levels. Our work has only just begun. The damage done by the Brownback administration cannot be undone overnight. It will take years to restore Kansas. But, it can now be said that the steps to restoring our state began in the 2017 session of the Kansas Legislature. Over the past few years, Moody’s has downgraded the state’s credit rating multiple times, citing fiscal instability caused by ongoing budget shortfalls. The most recent credit downgrade came from S&P back in February. This credit rating adjustment is further proof that the Kansas Legislature made a step in the right direction with the passage of the new tax plan. · It restores the 4 percent funding cuts to Regents Institutions. The governor signed the budget bill into law, but made two line item vetoes. Both vetoes are related to disability services and the Brownback administration having control over consolidating services. I have been receiving a number of inquiries from state employees regarding the specifics of the pay increases. The budget is structured with three different categories. First, judicial branch employees are all receiving a 2.5 percent pay increase. State employees who were hired before July 1, 2012, and have not received a pay adjustment will receive a 5.0 percent pay increase. Employees hired after July 2, 2012, and are considered new hires (meaning they have not held a benefits-eligible position with the state prior to being hired into their current position) will receive a 2.5 percent pay increase. The intent of this structure is to ensure that state employees who have not received a pay adjustment or promotion of any kind will receive a pay increase. In response to the teacher shortages and other issues with the working after retirement policies implemented in recent years, the Kansas Legislature adjusted the law and the governor signed it. Effective January 1, 2018, there is no earnings cap. Additionally, for retirees under the age of 62, there is a 180-day waiting period before they can return to work. Retirees 62 and older have a 60-day waiting period. Employers do not make a contribution for employees who work less than 630 hours or less in a calendar year. Employers do make the statutory contribution on the first $25,000 of the employee’s earnings in a calendar year and 30 percent on earnings that exceed the first $25,000. Pre-arrangement for employment is still prohibited as it was under current law. On March 2, the Kansas Supreme Court ruled that funding for K-12 schools is constitutionally inadequate, and ordered the Kansas Legislature to increase funding to schools by June 30. On June 5, the Senate passed a school funding plan on a vote of 23-17 and in the House on a vote of 67-55. I did not support the plan as I believe it riddled with flaws and I do not believe it will pass court muster. This is why I submitted a constitutional protest to reflect these concerns in the Senate Journal. It fails to provide adequate funding. It provides $294 million in new money in the next two school years. This means the per-pupil amount will only grow from $4,006 to $4,128 over that same period. (This amount does not factor in any additional weightings or costs affiliated with KPERS.) While this is an increase in base state aid, it falls far short of achieving the high-water mark of $4,400 in the 2008-09 school year, meaning that five years from now we will still be below where we were eight years ago. It creates equity issues. Discrepancies in weightings provide a handful of districts with opportunities to receive more funding than others disrupts the equity ruling made last year by the Kansas Supreme Court. All Kansas children have the right to a quality education regardless of their geographic location or their family’s financial status. These weightings prevent that from happening. The governor signed the bill into law on June 15. It now goes to the Kansas Supreme Court, who will determine whether it satisfies their opinion of what is constitutional in terms of adequacy and equity. The Kansas Supreme Court is allowing the law to go into effect while they review it. This allows schools to remain open and for districts to move forward with making plans for the upcoming school year. The Court is scheduled to hear oral arguments on July 18. If they rule that it is not constitutional, there will likely be a special session. Governor Brownback allowed the bill that exempts certain healthcare facilities from concealed carry of handguns to go into law without his signature. Senate Substitute for House Bill 2278 exempts state or municipal-owned medical care facilities and adult care homes, community mental health center, indigent health care clinics, and any building in the health care district associated with the University of Kansas Medical Center. Under previous law, these buildings would have been required to have adequate security measures in place or would have been required to allow concealed carry of handguns. I voted in favor of this bill. This law, however, does not address guns on college campuses. As of July 1, 2017, it will be legal for guns to be carried on campus unless appropriate security measures have been installed. The Legislature passed and the governor signed into a law the requirement for the appointment of a Child Welfare System Task Force by the Department of Children and Families (DCF). This task force would be required to provide additional study and oversight of DCF’s administration of child welfare, protective services, family preservation, reintegration, foster care, and permanency placement. The first report to the Kansas Legislature by the task force is required in January 2018 with a final report by January 2019. This year is an election year for locally elected positions. Mark your calendars: August 1, 2017, is Primary Election Day and November 7, 2017, is General Election Day. On the ballot will be local races for Mayor, City Council, and local school boards. Are you registered to vote? Check your registration status by clicking here. You may think that your one vote doesn’t count, but it does. A full list of candidates and more information regarding the upcoming elections can be found on the Shawnee County Election Office’s website (www.snco.us/election).